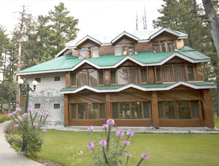 The Grand Mumtaz Resort, Pahalgam, is a brilliantly constructed hotel that has earned high accolades from the guests. It is counted among the top-notch 4 star deluxe hotels of Pahalgam, and is equipped with all the modern day facilities that ensure a comfy stay for the visitor. Further, the round the clock services rendered by the hotel staff. They make sure that all the needs of the guests are fulfilled even before being asked. Furthermore, located near the popular tourist hot spots, the Grand Mumtaz enjoys the stature of being one of the most preferred resorts of Pahalgam. Accommodation The Grand Mumtaz Resort has 82 Rooms and 24 Suites. These well furnished rooms and suites are classified as Single Deluxe Rooms, Super Deluxe Double Rooms, Executive Suites and Presidential Suites; thus, the guests can select an option as per their need. All these rooms are complemented with state-of-the-art architecture and contemporary amenities. Be it central heating or a cable connection with multiple channel options and four music channels, everything is dully installed in the rooms. 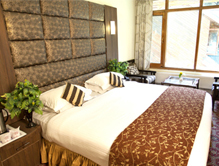 Beside this, the 24x7 room services ensure that everything is at the disposal of the guests. Dining A connoisseur of food can’t resist visiting the Samavar multi-cuisine restaurant of the Grand Mumtaz Resort. All the delicacies served at the restaurants are perfect to tickle the taste buds of the guests. 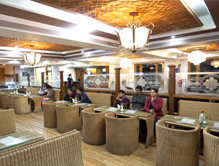 In addition to the restaurant, the resort also has an in-house coffee shop whose aroma is matchless. We, at Tour My India make it easy for you to book a hotel in Pahalgam. Our diligent team members are very prompt in booking hotels as per your choice and need, and thus, you can put your mind at rest. So, if you wish to stay at the Grand Mumtaz Resort, Pahalgam, allow us to make the arrangements for you.